PRINCETON, N.J. (AP) — Vera Rubin, a pioneering astronomer who helped find powerful evidence of dark matter, has died, her son said Monday. Vera Rubin, who transformed modern physics and astronomy with her observations showing that galaxies and stars are immersed in the gravitational grip of vast clouds of dark matter, died on Sunday in Princeton, N.J. She was 88. Her death was announced by the Carnegie Institution of Washington, where she had been a longtime staff astronomer. Dr. Rubin, cheerful and plain-spoken, had a lifelong love of the stars, championed women in science and was blunt about the limits of humankind’s vaunted knowledge of nature. Her work helped usher in a Copernican-scale change in cosmic consciousness, namely the realization that what astronomers always saw and thought was the universe is just the visible tip of a lumbering iceberg of mystery. Scientists now know we are not the center of the universe, nor are we even made of the same stuff as most of creation. Cosmologists have now concluded that there is five or 10 times as much dark matter in the universe as there is ordinary atomic matter — the stuff of stars, planets and people. What it is, nobody knows, although theories abound, and attempts to identify it in laboratory and particle-accelerator experiments and in outer space have transfixed modern physics. President Bill Clinton awarded Dr. Rubin the National Medal of Science in 1993, and she was frequently mentioned as a candidate for the Nobel Prize. Sandra Faber, a staff astronomer at the University of California, Santa Cruz, said that Dr. Rubin, along with Margaret Burbidge, who is retired from the University of California, San Diego, was a “guiding light” for a generation of female astronomers. 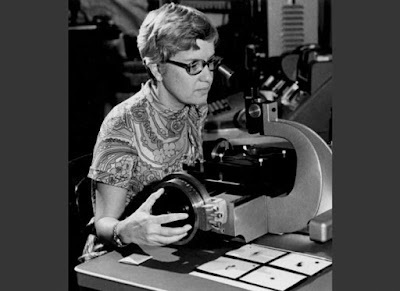 She was born Vera Florence Cooper on July 23, 1928, in Philadelphia, the younger daughter of Philip Cooper, an electrical engineer who worked at Bell Telephone, and Rose Cooper, who had also worked at the phone company but had to quit her job because of nepotism rules. The family moved to Washington when Vera was 10. She later said she had become entranced by astronomy from watching the stars wheel past her bedroom window. That year, she married Robert Rubin, who was then a graduate student in physical chemistry at Cornell. She had hoped to get a Ph.D. from Princeton, but the astrophysics graduate program did not admit women at the time and declined to send her a course catalog. So instead she went to Cornell to obtain a master’s degree and finished it in 1951. When her husband got a job at Johns Hopkins in Baltimore, the family moved to Washington and she enrolled at Georgetown University. She earned her Ph.D. there studying the properties and motions of distant galaxies while raising her children. Robert Rubin died in 2008. A daughter, Judy Young, who was also an astronomer, died in 2014. Dr. Rubin is survived by her sister, Ruth Cooper Burg, a judge in Washington; her sons, Allan, David and Karl; five grandchildren; and a great-granddaughter. Breaking into the field was never easy. One day in 1950 she drove with a month-old baby through a snowstorm to a meeting in Pennsylvania to deliver a paper with data, which she later decided was questionable, about the rotation of the universe, only to be chastised and humiliated by “senior astronomers,” she said. She fled the city and the issue of cosmology. Another time, she recalled, she was excited to be summoned to a meeting with the eminent astrophysicist George Gamow, only to learn that they would have to talk in the lobby because women were not allowed upstairs in the offices. Dr. Rubin joined the Carnegie Institution, in its department of terrestrial magnetism, in 1965, after holding teaching posts at Montgomery College in Maryland and at Georgetown. Yet by Dr. Faber’s account, she still had to battle for access to a 200-inch telescope on Palomar Mountain in California jointly owned by Carnegie and Caltech. When she did get there, she found that there was no women’s restroom. As her friend and institute colleague Neta Bahcall later told Discover magazine, Dr. Rubin taped an outline of a woman’s skirt to the image of a man on a restroom door, making it a ladies’ room. By then, averse to controversy and the sharp elbows of “senior astronomers,” Dr. Rubin was looking for a field of research that would keep her out of trouble. “I wanted a problem that nobody would bother me about,” she said later. That was when she stumbled into the most daunting problem in modern astronomy: the discovery that most of the universe is invisible. Teaming up with a young Carnegie colleague, W. Kent Ford Jr., Dr. Rubin set out in the early 1970s to map the distribution of mass in spiral galaxies by measuring how fast they rotated. The faster the stars were going around, the more gravity, and thus mass, must be keeping them in their orbits. They expected to find that most of the mass was where most of the starlight was, at the centers of the galaxies. In that case, stars on the outer fringes of a galaxy should have been moving more slowly than those in the inner regions — the way Pluto, on the outskirts of the solar system, takes 248 years to go around the sun, while Mercury speeds around in 84 days. To their shock, however, they found that the stars on the outskirts of galaxies were not slowing down; if anything, they were speeding up. By the laws of either Newton or Einstein, it meant that there was extra mass out there where there was relatively little light, mass that was speeding up the stars. “Great astronomers told us it didn’t mean anything,” Dr. Rubin said. Told to look at more galaxies, they did, and the effect persisted. In fact, the idea that there was more to the universe than could be seen had been lurking on the edges of scientific respectability since the 1930s, when the Caltech astronomer Fritz Zwicky deduced that some invisible “missing mass” was required to supply the gravitational glue that held clusters of galaxies together. Otherwise, with the galaxies moving so fast, a cluster would simply fly apart. Another boost to this idea had come in 1973, when the Princeton theorists Jeremiah Ostriker and James Peebles suggested, based on computer simulations, that spiral galaxies would warp and fall apart — because of gravitational forces from stars — unless they were embedded in a halo of dark matter, like a hamburger patty surrounded by a bun. Dr. Rubin and Dr. Ford’s work brought these ideas to center stage. “Vera’s work, mostly in the early ’80s, clinched the case for dark matter for most astronomers,” Dr. Ostriker wrote in an email, noting that she had been working with familiar galaxies and the kinds of optical observations that astronomers understood. It helped that at the same time theoretical physics was exploding with new ideas, like supersymmetry and string theory, which implied the existence of new kinds of subatomic particles left over from the Big Bang and floating around the universe (and through our bodies) in clouds. It has gotten worse. A wide range of astrophysical and cosmological measurements have subsequently arrived at an intimidating composition of the cosmos: 5 percent atoms, 27 percent dark matter and 68 percent the even more mysterious dark energy that seems to be speeding up the expansion of the universe — all of which subverts any illusion that astronomers might actually know what is going on. In three decades of searching, the experimentalists have not found any trace of Dr. Glashow’s garbage, notwithstanding occasional rumors that the dark matter particle, the secret ingredient of the universe, has been spotted in some underground tank or fleeing through the detectors at a place like CERN, the European Organization for Nuclear Research in Geneva. If true, the rumors could have sent Dr. Rubin straight to Stockholm to pick up a Nobel Prize. Some theorists have suggested that Einstein’s theory of gravity, general relativity, might have to be modified to explain the dark matter observations. During one of those flurries of excitement, in 2009, Dr. Rubin, who liked to stick to the facts, kept her cool. “I don’t know if we have dark matter or have to nudge Newton’s laws or what,” she said at the time. PRINCETON, N.J. — Vera Rubin, a pioneering astronomer who helped find powerful evidence of “dark matter” in the universe, has died. She was 88. Allan Rubin says his mother died Sunday night of natural causes. A Philadelphia native, Vera Rubin had been living in the Princeton, New Jersey, area, he said. Rubin found that galaxies don’t quite rotate the way they were predicted, and that lent support to the theory that some other force was at work, namely dark matter. Dark matter, which hasn’t been directly observed, is believed to make up 27 percent of universe — as opposed to 5 percent of the universe being normal matter. Scientists better understand what dark matter isn’t rather than what it is. Rubin never received the Nobel Prize for her work, but her name was long floated for the prestigious award. Emily Levesque, an astronomer at the University of Washington in Seattle, is among those scientists who believe Rubin deserved the honor. In addition to her breakthrough discoveries, Rubin was considered a champion for women in astronomy, putting constant pressure on powerful factions in the field to recognize women’s contributions. Invited to the highly regarded Palomar Observatory outside San Diego early in her career, Rubin did not accept the building’s lack of a women’s restroom at face value. In recent years, Rubin was reportedly unhappy that stubborn gender inequities continued to pervade her field. In 2000, she told Astronomy writer Ann Finkbeiner she was “getting fed up... What’s wrong with this story is that nothing’s changing, or it’s changing so slowly,” the magazine reported. Rubin’s interest in astronomy began as a young girl and grew with the involvement of her father, Philip Cooper, an electrical engineer who helped her build a telescope and took her to meetings of amateur astronomers. She was the only astronomy major to graduate from Vassar College in 1948. When she sought to enroll as a graduate student at Princeton, she learned women were not allowed in the university’s graduate astronomy program, so she instead earned her master’s degree from Cornell University. 0 Response to "Vera Rubin, who did pioneering work on dark matter, dies"